Ever dreamt of having a garden where you could grow your own vegetables but never really knew where to start? This list shows you five everyday vegetables, herbs and roots that will sprout from leftovers—and you won’t even need a massive backyard! As easy as it is to add in lettuce into your salad or sandwich for some extra crunch, you might find that growing lettuce is even easier. All you need to do is place the stem of scrap lettuce in a bowl of water, and place the bowl in a sunny spot. Change the water every other day. Watch your lettuce grow—not just the leaves but also the root. It will start to taste bitter after 10-12 days of growth, so "lettuce" treat ourselves with a healthy, delicious salad before that. Did you know growing celery from root scrap could look so aesthetically pleasing? Maybe not just for the greens but do it for the décor as well. Cut the end off and submerge it in water, with the raw end facing up. Place it under the sun and change the water every other day. After a week, cut stalks may start to form around the roots and some may even be brown. Don’t panic! It just means now’s the time to plant it in the soil and let it grow. Remember to keep the soil moist, but not wet. Basil is a relatively easy herb to grow. 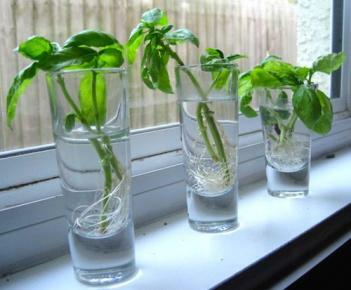 Place a whole stem or two in a water-filled glass, with the leaves out of the water. Once again, remember to change the water every other day. Show your baby basil some love with ample yet indirect sunlight, which will allow the roots to grow a few inches long in a couple of days. After that, transplant into soil and watch new shoots grow. You can give your ginger a soul by resurrecting it back to life from little scraps, and it’s mind-boggling how easy it is to do so. Just plant a thumb-sized piece in moist soil, with the buds facing up. In just a week, you can harvest the plant to make a nice cup of soothing ginger tea. You deserve it! 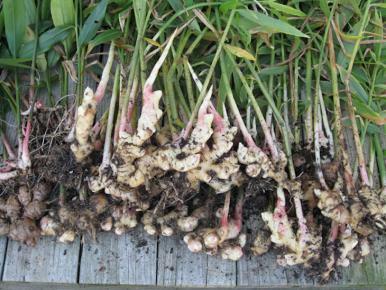 If you want to re-harvest the ginger, save a small piece of the rhizome for your second round of GIY. The next time you cut your onions you may tear up, but out of happiness: onions are one of the easiest vegetables to regrow. Cut the root end with half an inch of the flesh still on it. Place it under abundant sunlight and cover the top with soil. 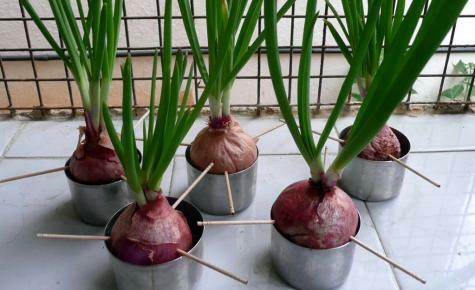 Make sure the soil is kept moist and remember that onions are happiest in a warm and sunny environment.